The Gibb! If you have a bucket then this should be on your list. The Gibb River Road is one of Australia’s absolute “must do” experiences. As the southern states shiver through May to August, the Kimberley experiences pleasant, dry weather in the high 20s and early 30’s. Walk into tropical gorges and take a swim in one of the many amazing swimming holes. Nestled at the end of the Gibb River Road is El Questro. Famed for it’s very expensive homestead accommodation (don’t worry – you can camp there for $20 a night) it also boast some of the best walks in the Kimberley. Read on for a description of some of our favourite walks in El Questro station. 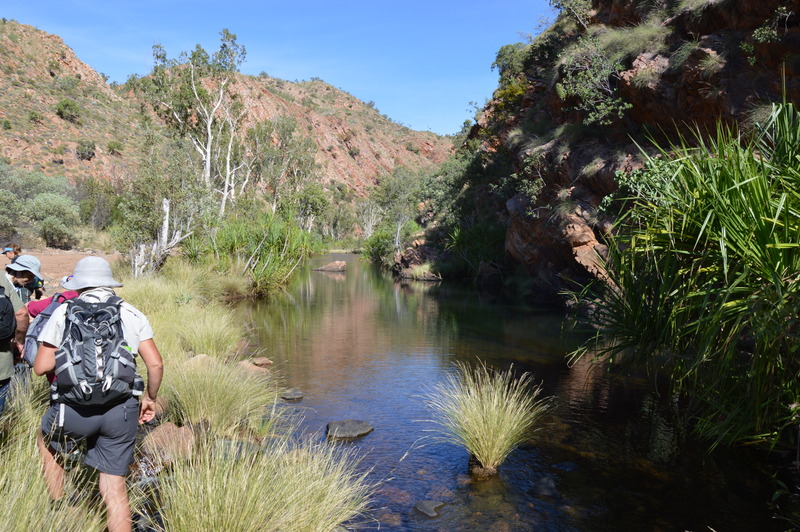 3.2 km return – 1 to 2 hours: Almost every abled person that goes to El Questro does the Emma Gorge walk… and for good reason. It is a beautiful little walk. A little rocky underfoot but still really easy. This is a well worn path so no chance of taking a wrong turn. Be warned, the swimming hole at the end is beautiful and will take your breath away… because it is freezing cold. Don’t worry though, there is a little thermal hot spring on the right hand side against the rock wall. You can sit in the hot water impressing your friends while you watch their teeth chatter! 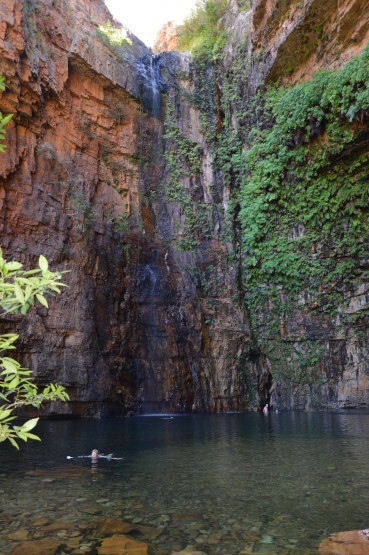 3.4 km return – 2 to 3 hours: This is what awaits you in Amalia Gorge walk in El Questro. Cristal clear green water with the red rocks of the Kimberley. A wonderful walk with few challenging rocky sections. One spot in particular requires a little bit of confidence with heights, but the walk is well worth it and not particularly difficult. There are two spots for a swim. One is about half way to the end (it is not a loop walk) and one right at the end. The latter has very tall water fall and quite a deep pool. This is a 5 star walk! 7.2 km – 3 to 5 hours: One of the more challenging walks on the station but also one of the most fun. This is a very narrow gorge with steep rock walls. 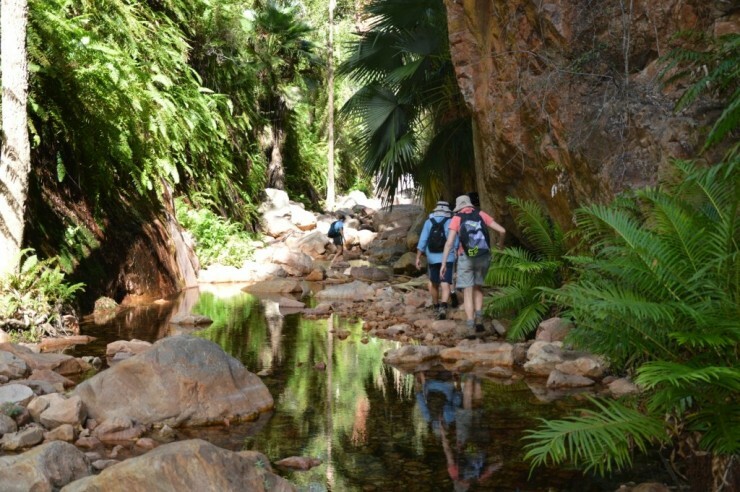 El Questro gorge is a good one to do later in the day as it is relatively shady the whole way. At the half way point there is a quite a difficult boulder to pass and there is no shame in turning around at this point. If you have the time and the upper body strength, it is definitely worth continuing on though. A lone aboriginal hand print can be found on the right hand side not far past the half way point. Soon after the trail gets very rugged and it is only recommended for people with a good level of fitness. If you can get to the very end another one of the Kimberley’s great water holes awaits you for your dipping pleasure. 5 km – 3 hours: This walk is best done in the early morning as it is quiet exposed. The trail crosses the river a few times which requires you to walk across rocks. For those with poor balance, this can be tricky but if you take your time it shouldn’t pose much of a problem. This is a loop walk and we recommend walking clockwise if you are doing it in the morning and counter clockwise if you are doing it late afternoon. i.e. the first section going clockwise is quiet exposed to the sun. A great walk and well worth the effort. There is a swimming hole right at the end. Apparently there are fresh water crocs in there, but we have never seen any. These are just four of the great walks available in El Questro. If you have done any of these walks we would love to hear your thoughts. To see more photos of El Questro, visit our Flickr page. 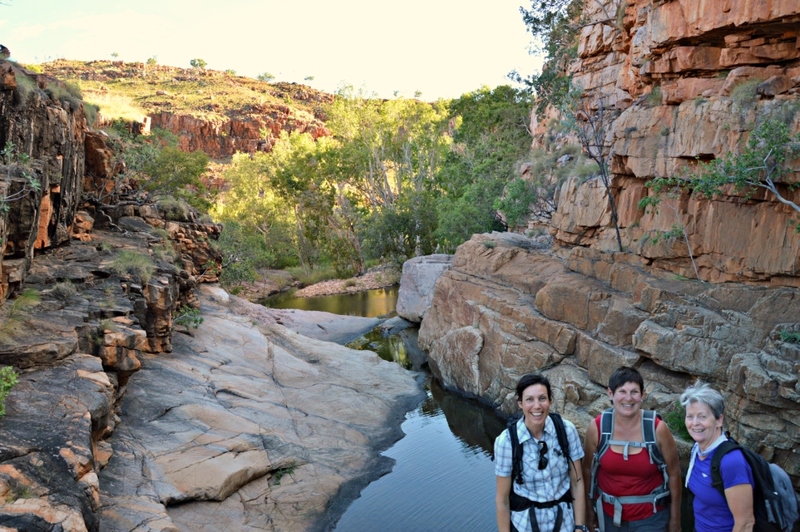 To see details of our Kimberley Walking Tour visit our tour page. Thanks for the very helpful post, and amazing photos. We plan on visiting El Questro next year, and are currently reading through as much information as we can!